We had a great time at our May 16th class. It was even a mini reunion with two of my fellow high school graduates attending. It was a lot of fun, especially when I flicked paint on several unsuspecting observers. Oops. Thanks so much to all who participated! 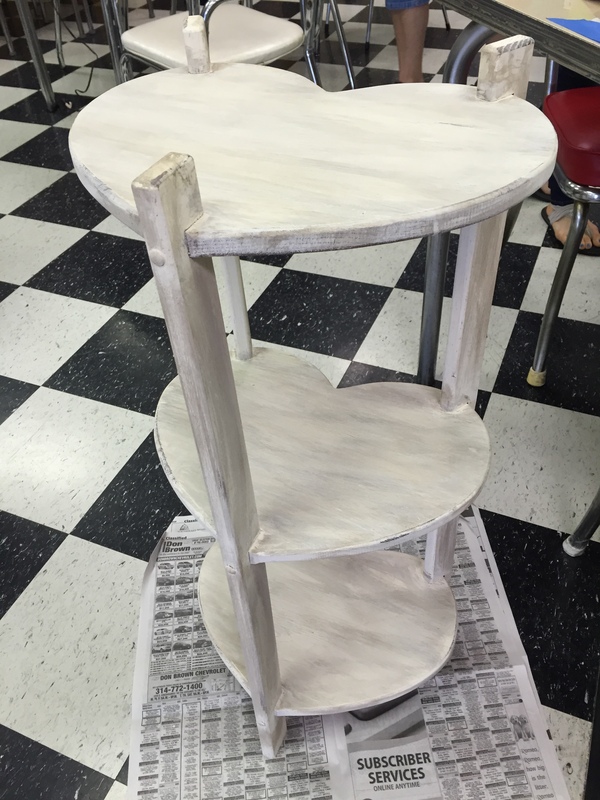 Your projects are going to look great and I can’t wait to see pics of them on display. You all picked some beautiful colors. We even had one project using the crackle distressing technique.The class was held at Gift Emporium and Cafe‘ in Sullivan. 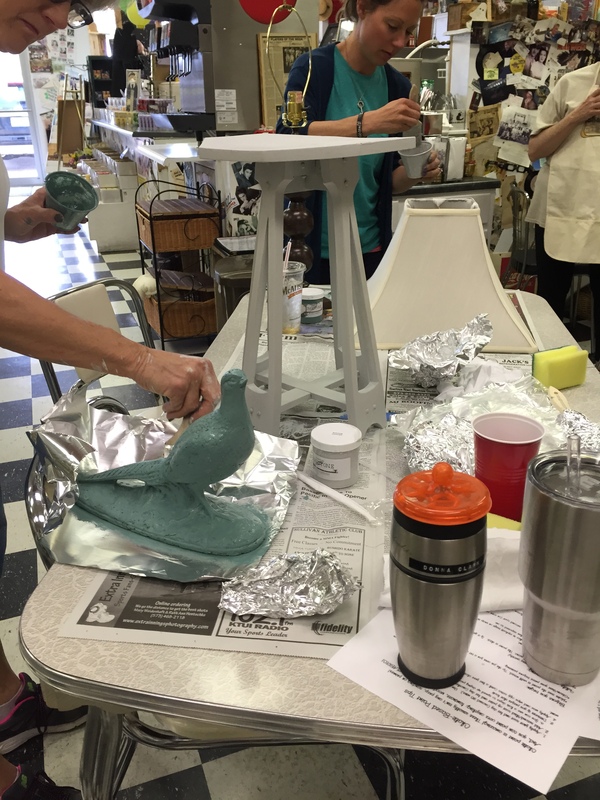 Class started with learning painting, distressing, waxing, and sealing tips, then participants talked, ate, laughed, and enjoyed seeing each other’s projects and all the colors of paint being used. Interested in learning more about chalk-based paint and tips on applying it and the best way to seal it? These people and others who have taken the class will tell you it really isn’t hard to do and the transformation is amazing! To learn more about our classes, which are usually kept to 6-8 participants, visit SharSum Paint’s Painting Class page. Update: Our June 20, 2016 class is now full, but we are now enrolling for our July 11th class. 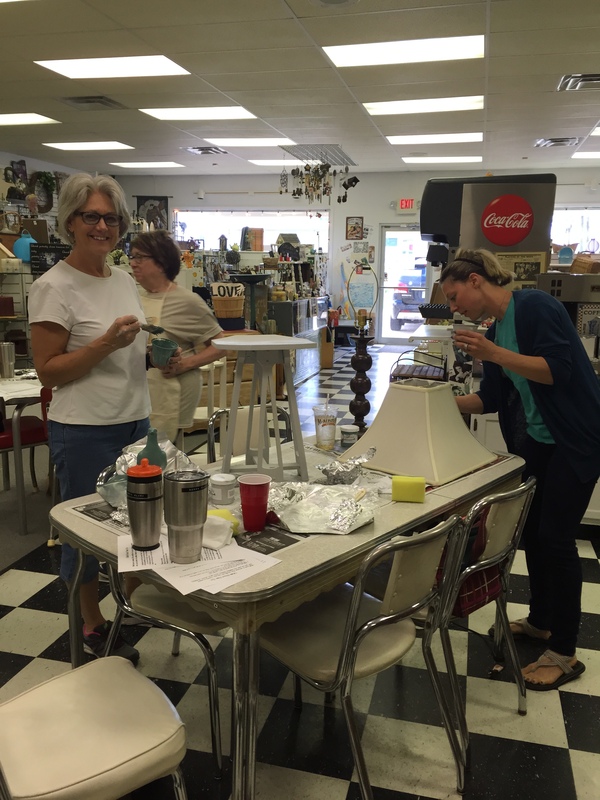 See our Painting Class page link above for more details on our classes. My chalk-based paint of choice is Missouri Limestone Company because, as you know by now if you’ve been reading my blog, I love it so much I’m now selling it locally! So, when I see an idea using chalk-based paint, I just substitute with my MLP! My project for last night was to paint my wrought iron plant stand. There was no rust flaking off, so I cleaned this old thing up then gave it one coat of Missouri Limestone Paint’s “Homemade Ice Cream”. It now matches my newly painted front door. I know exactly what plant I’m going to buy for it in the morning at Lowe’s. 😍 I have plans now for my wrought iron set. Update: Here’s a photo of my new look for the front of my house. The wrought iron furniture is painted and the set turned out great! A few weeks ago, I talked about antiquing kits from the 1960’s. 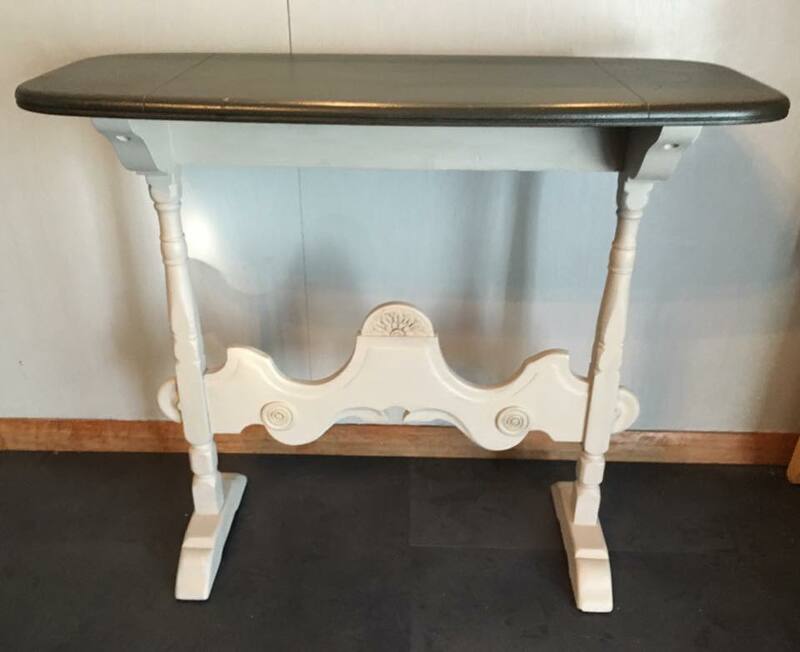 The little table I was to paint for a friend had been “antiqued” by her grandmother and now I was giving it a new life for the HER granddaughter’s newly painted room. Love the passing down of a treasured heirloom. It makes me so happy to make others happy. This is my favorite part of what we are doing in our retirement years; refurbishing, painting, and selling with chalk-based paint. Paris stenciled with Sunday Silver chalk-based paint. As I was finishing up my “Ombre” desk set re-do, I thought about my collection of essential oils.The drawers of the desk were in very good shape and had no odor whatsover. However, I’m into essential oils and I have an oil from Young Living called Cedarwood. I decided I would wipe down the drawers with a mixture of water and about 10 drops of Cedarwood. I thought that might be a perfect scent for a wooden drawer, right? It smelled so good, I put a little oil on q-tips and put one in each drawer for awhile. I love opening the drawers and getting a faint whiff of Cedarwood. You might try a favorite scent in the drawers of something you are working on or purchased. Another tip…..if your drawers do have an odor, paint or spray a coat or two of Zinsser water-based shellac to seal in odors such as smoke or a musty smell. These odors won’t penetrate through the shellac. This works on stains, too. 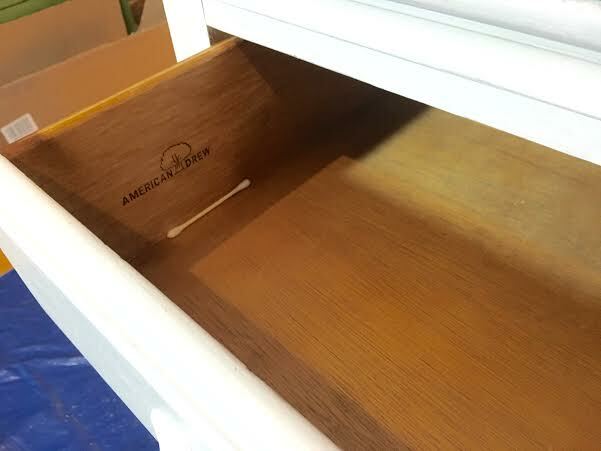 Q-tip dipped in essential oil and placed in drawer for a short time. It’s been awhile since I added sold projects, so thought I’d update and add a few. This has to be my favorite piece I’ve sold. It was shipped all the way to Virginia. This was a watercolor technique I came up with, staining the wood with a paint wash. Read all about the Rags to Riches story of Sir Albert on my blog! The unassembled parts of a hutch we recently finished for a client. Too big to put back together in my house. Don’t you just love the decoupaged knobs and drawer sides? This dining room set is one of my favorite ones we’ve painted and sold. 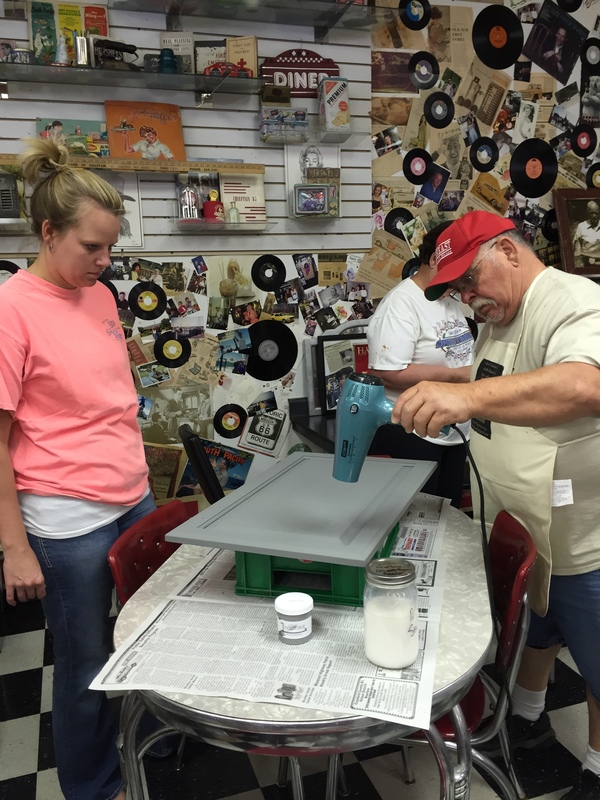 We even paint and sell jewelry boxes. Yes, this pink one is really a jewelry box. This one was actually a gift. It is a memory box I made for my sister with a vintage photo of my mom and her sisters decoupaged on the top. Have a photo of your own? We have more jewelry boxes. We can copy your photo and make one for you! This client owned set was just what she was envisioning. We even painted books to go in the basket we painted for one of the nightstands. We paint and sell smalls, too. Like these vintage sewing machine drawers. We have turned several Queen Ann captain chairs into colorful, whimsical works of art. This one we donated to my grandson’s kindergarten classroom. We had fun with this set. 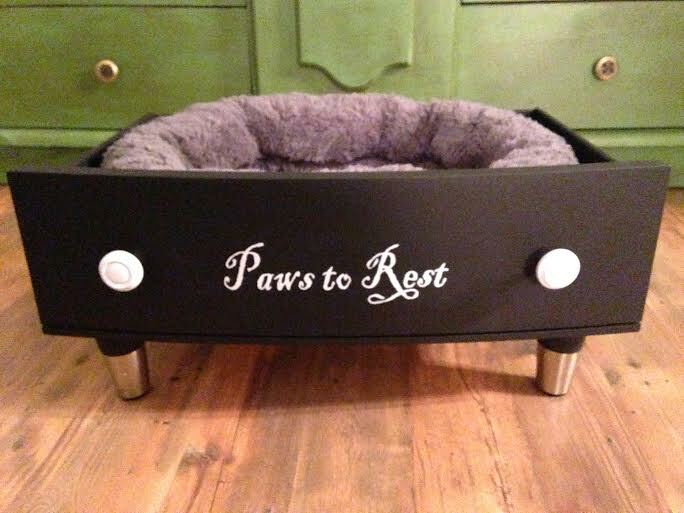 Client purchased it to donate to a heart charity auction. We painted a bunch of these cute little vases. 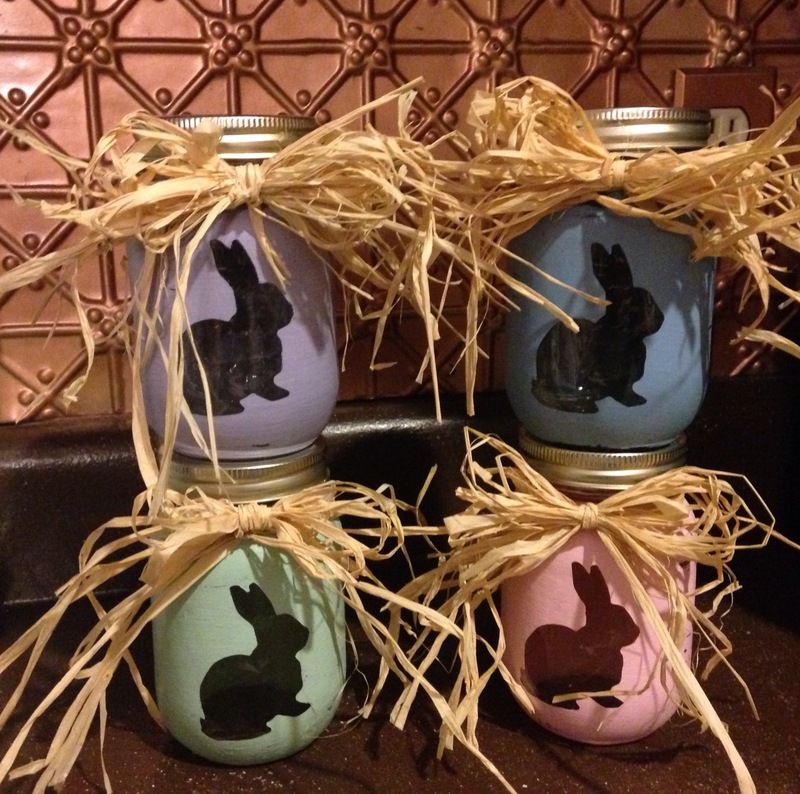 Can paint these with your color choices. I love filling mine with fresh blooms from my yard. This is a cute little cabinet we reinvented with a farmhouse look, custom painted with client color choice. We can do that. Just ask!! This was a little bench I painted with Missouri Limestone Psint Company’s January and Crepe Myrtle. Stencils were cut using my Silhouette Portrait machine and contact paper. This is another piece I really hated selling. I was so wishing I had a 4 season room. I would have kept this little table set in a heartbeat. I had this waterfall set and custom painted it for a customer. She wanted the dresser to be gray with some of the wood still showing. The wardrobe’s inspiration was from a piece she saw on Pinterest. We even found the same exact vinyl design on Amazon. Another Steam Punk look for a customer that loves the look. The middle piece of marble was broken on this coffee table and had been replace by a piece of glass. We covered a thin board with this map fabric from Jo-Ann’s and it fit perfectly under the glass. Gave it a black paint job and sealed it with poly. This was such a fun project! This dated wooden nautical clock was blah, until I turned it into a Steam Punk look with a little black paint and wax. Love Pinterest. That’s where we got the idea to take chairs and turn them into a bench. The bench is 3 chairs put together. We used the back legs of the 4th chair to create the sides. This bench sold with a table and chair set my friend was selling. Love how it all turned out. 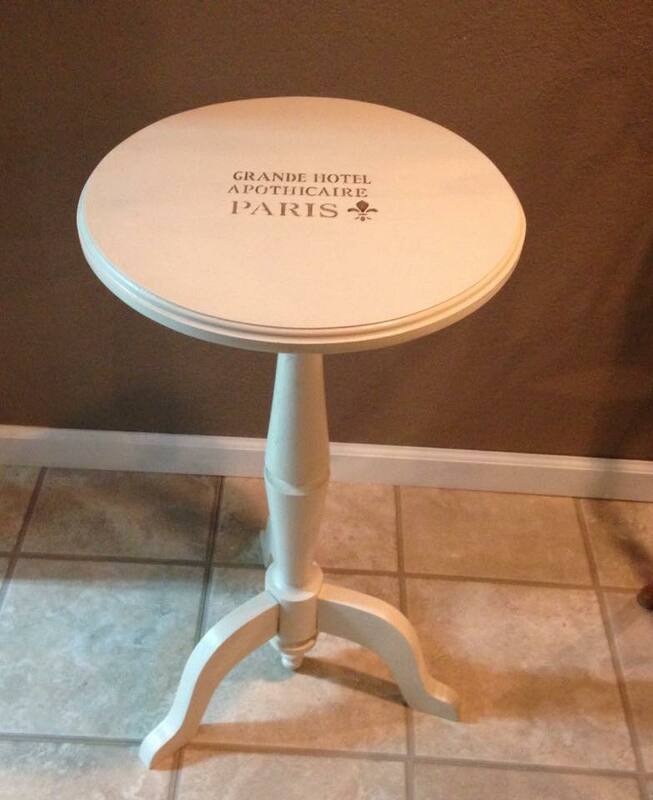 This is one of my first “restoration hardware” looks I did. I really enjoy trying out different painting techniques. I loved painting the gray ombre desk so much, I painted the dresser that matched it the same way. The lady that bought the desk snatched up the dresser right away. I didn’t sell this one. This is my front door, and my wrought iron furniture I have in my front yard. The door is metal. I did this about 3 months ago and still haven’t sealed it. I’m not sure I will. It is holding up well. This hutch and desk was a drab, yellowish color and had seen better days. Painting it with varying shades of pink made all the difference in the world. This is one of my all time favorite pieces. I would have kept this one if I had the room in my house. We had another client who had 6 chairs that needed painting. We took that project on and delivered them back home this past week. They look gorgeous with the dining room table that was handcrafted by the husband. A beautiful set at the fraction of what a new one would cost. This little vanity table was a family heirloom. It had been “antiqued” by the client’s grandmother back in the 1960’s. Read more about that here. The client had admired the Ombre desk I had completed and so the vanity has the same type of look, with the addition of a stencil to give it a french-style look. Ombre Desk Set – painted in varying shades of gray – Missouri Limestone’s Chalk-based Paint – Winter Gloves, Sunday Silver and Gray Goose. 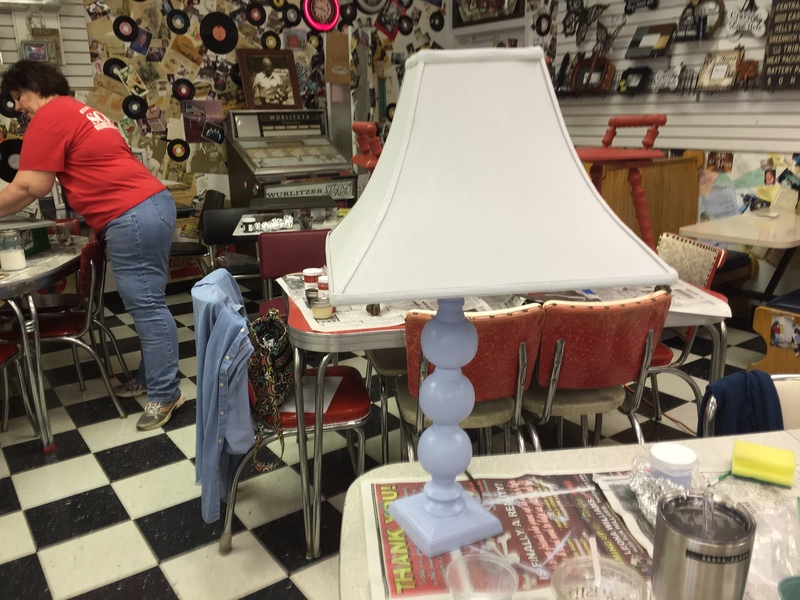 Lamp is painted with Indigo. 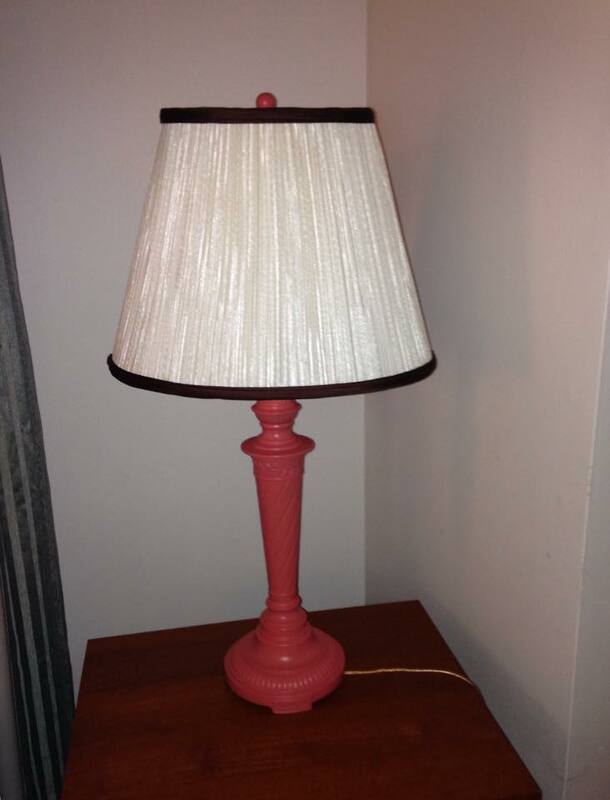 Lamp painted with Vintage Coral. The small table is sitting happily in its new home. Looks like the colors go perfectly with the decor in the home. SharSum Paint’s April 16 class was so much fun! It was held at Gift Emporium and Cafe‘ in Sullivan. The projects everyone brought in to paint were just perfect. 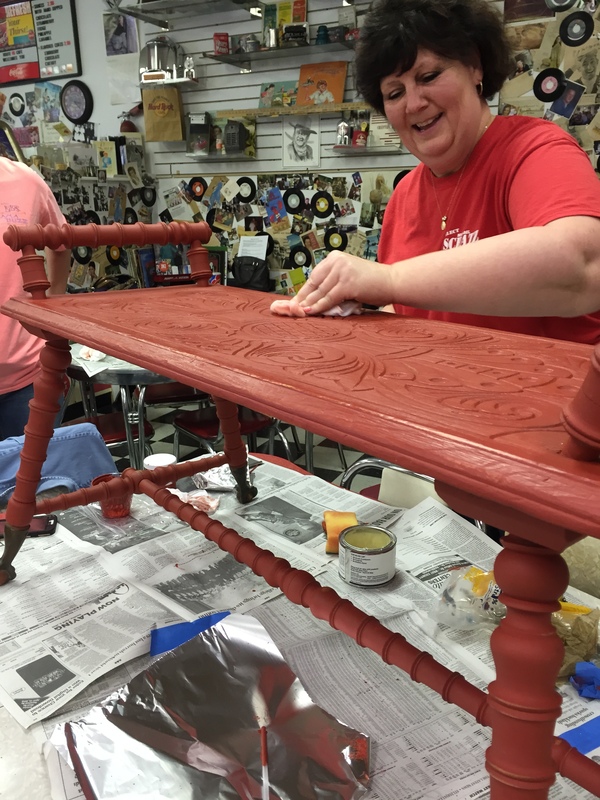 Participants were able to paint and wax/seal their projects in the 4 hour class. 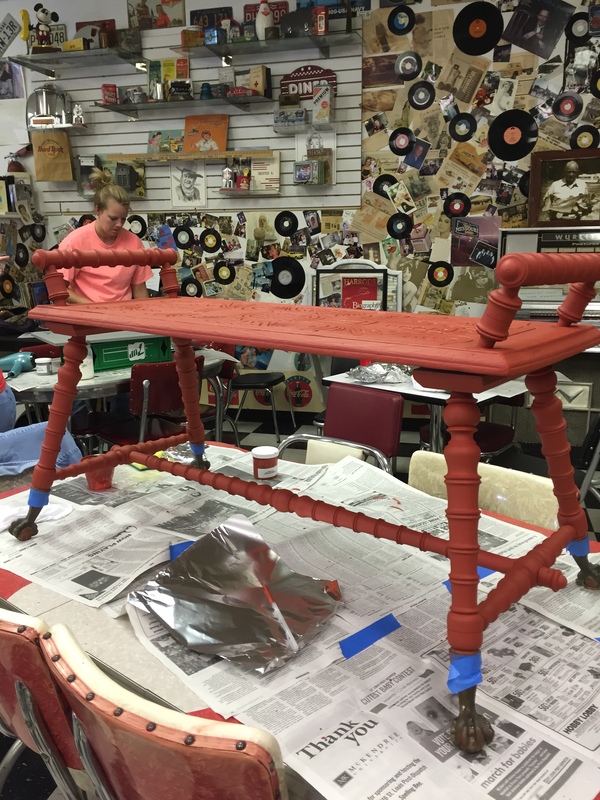 In between drying times, they learned painting, distressing, waxing, and sealing tips, talked, ate, laughed, and enjoyed seeing each other’s projects and all the colors of paint being used. Update: Our May 16, 2016 class is now full. See our Painting Class page link above for more details on our classes. 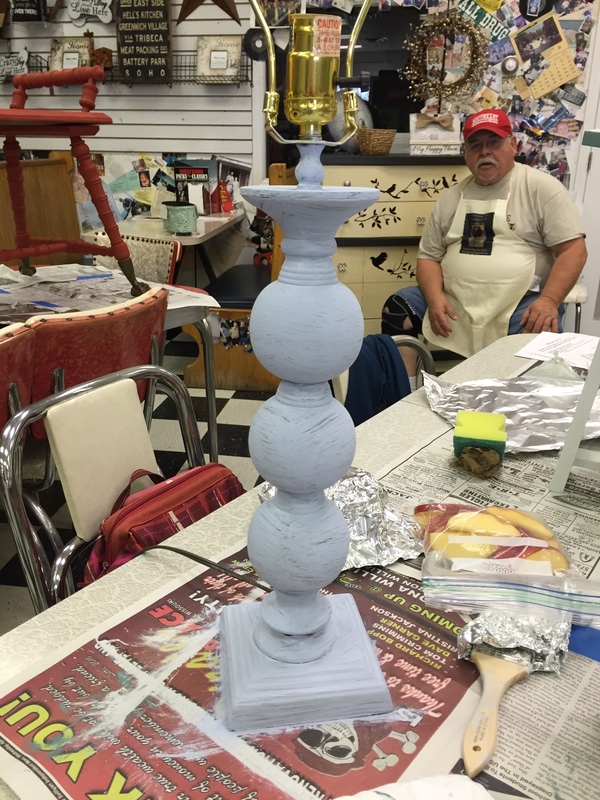 Donna’s plant stand and…..hard to see…..but a concrete bird partially (hidden by the drink tumblers), painted in “Something Blue”. Here’s a better view of Donna’s concrete bird – he will get no wax or seal. Outside items do not need it. The sun and heat will cure the paint. 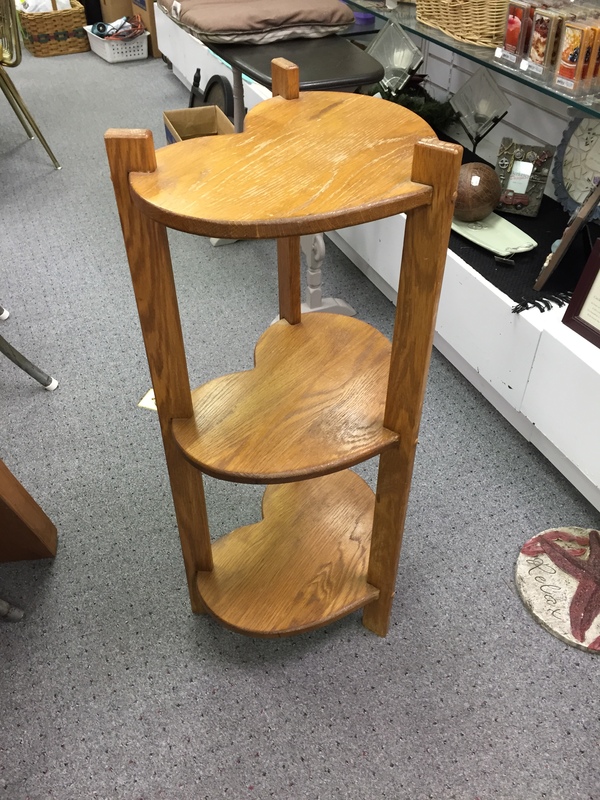 Christina brought in this beautiful claw foot bench. Painted, distressed just a bit, and waxed, she is thrilled with it and it is now going from basement storage to a prime spot in her entry way. This bench is just gorgeous! 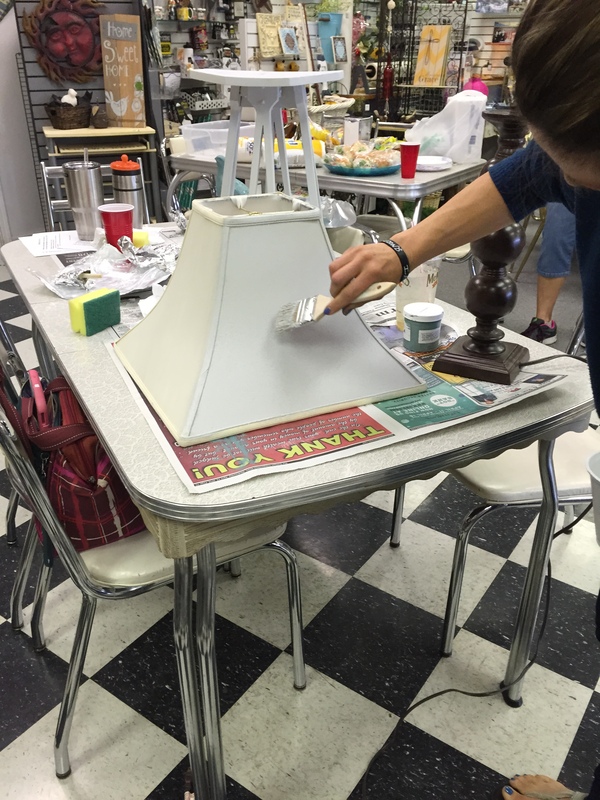 Megan is painting a fabric lampshade. Yep! Works great! Beautiful final project – went from a yard sale reject to a prominent place in a little girl’s bedroom. 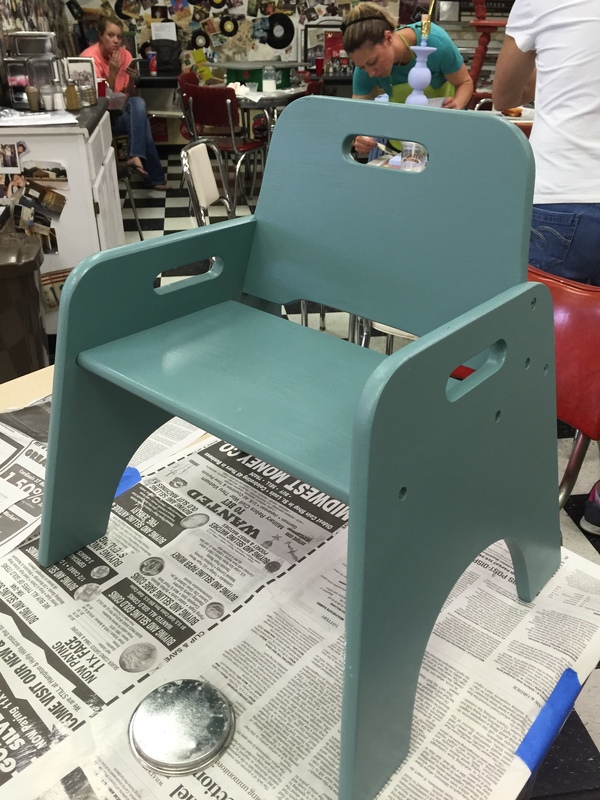 Megan also painted this cute child chair “Something Blue”. Her kids use in their bathroom for reaching the sink. She used a poly seal on it for durability. 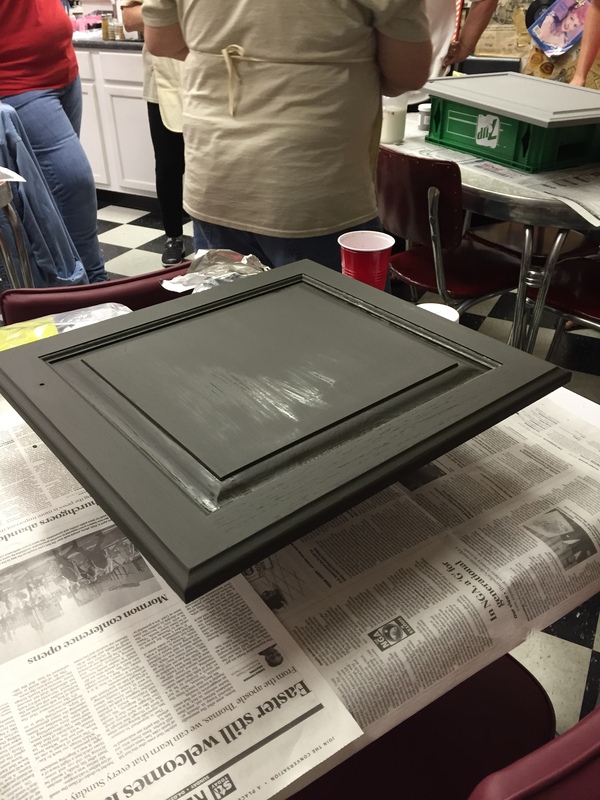 Next up for her – painting kitchen and bathroom cabinets! 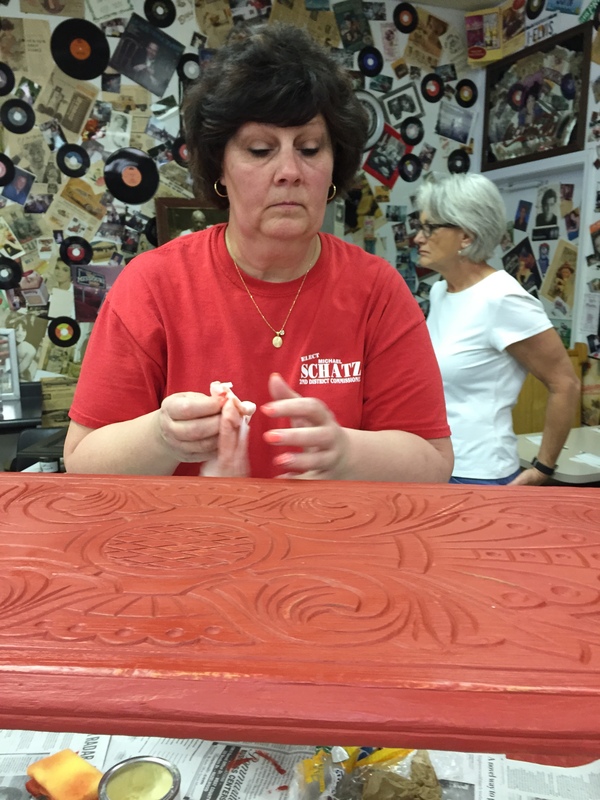 Danny is drying Mallory’s practice cabinet door so she can see how the Varathane polyurethane works and will look. She’s now going to paint her kitchen cabinets. Wendy brought in this small shelf to transform. Final look – After painting this shelf with “January, she did a light wash with “French Roast”. This gave it a little bit of a vintage look and broke up the pure white look of the shelf. A great time was had by everyone. All the projects turned out great. It was so much fun to see them coming to life.